Time is already running out for Nico Rosberg this season and, if he wants to mount a challenge for the championship, he has to turn the tables on Mercedes team-mate Lewis Hamilton sharpish. The last grand prix in Bahrain was an important race for Rosberg to win, because he was already some way behind Hamilton in the championship. In fact, he entered the weekend third overall, behind Ferrari's Sebastian Vettel as well. But Rosberg did not win - Hamilton did again. It was fortunate for Rosberg that Vettel had a bad day at the office - but Kimi Raikkonen's second place for Ferrari underlined just how difficult this year is going to be, for Mercedes in general and Rosberg, who finished third in the race, in particular. Fortunately, there is now a decent break before the next race in Spain on 10 May for him to have a think about what to do next. 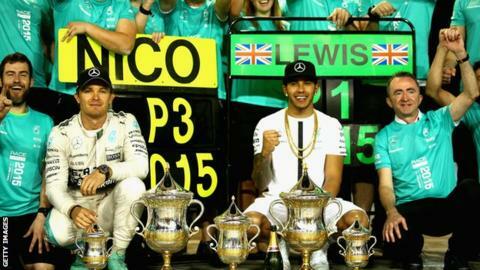 What has changed for Rosberg? Last year, Rosberg took the title battle to the final race, eventually losing out to Hamilton in Abu Dhabi. This year, Hamilton has been in control since day one, and after four races is more than a clear victory's worth of points ahead - 27 points in front. In reality, Hamilton has been on a roll since after the Belgian Grand Prix last year. Hamilton got a big lift out of Mercedes backing him following the collision between the two drivers at Spa. The team not only punished Rosberg privately, but admonished him in public as well. Rosberg was clearly quite badly affected by that incident. The team stopped smiling at him in quite the same way as before, and it appears that he looked inside himself and thought: "Actually, yeah, that was not appropriate; I should not have done that." Hamilton has been dominant from that moment on. The only time Rosberg has beaten him since was in the penultimate race of last year in Brazil, where it has to be said the German did a super job all weekend. Hamilton's momentum has carried on into this year, and he has eradicated his main area of weakness from 2014, which was his first flying lap in final qualifying. Hamilton got quite a lot of those runs wrong last year, and that put him under pressure on the final run, where Rosberg more often than not beat him. This year, though, Hamilton has nailed those first Q3 laps every single time, and the pressure is firmly on Rosberg. I'm convinced Hamilton has stepped up this year. He seems more at ease, with less pressure on him - which I'm sure comes from winning the championship again and feeling he has nothing to prove to himself. What can Rosberg do about it? Rosberg is an intelligent guy, and that has often been a strength, but this year he is over-thinking. When that happens, you tense up, and things don't flow. It stops being natural. It's happened to me in the past and I'm sure to every driver; in fact probably every sportsperson. You could see that after Q2 in Bahrain. In fact, Radio 5 live commentator James Allen and I had an on-air debate about it at the time. After Rosberg had been a second off Hamilton in Q2, James was very quick to pick up that Rosberg was thinking about the race and trying not to take too much out of that set of tyres - which is the one the drivers have to start the race on. Rosberg later admitted that was indeed on his mind. I said at the time I would prefer Hamilton's one-second advantage, because going into Q3 you know what the car is going to do and where your limits are. The driver is heading into that crucial final session knowing exactly what he has to do - and he also has the psychological advantage of that margin. It's like: "There you go, I've done it. Now you try to beat it." And that's exactly what happened - Rosberg qualified only third, and said afterwards that this was partly because he did not have a feel for the limit because he had been so conservative on his Q2 lap. I've experienced what Rosberg went through last year in sports car racing. Losing a world championship is one of the most gut-wrenching experiences a racing driver can have. You put so much effort and emotional energy into it - especially if it is a straight fight between two guys in the same team. There was high tension within Mercedes last year, which is very draining. At the end of it, the person who wins gets a massive boost and the other one has to recover from that, which does not happen overnight. When a driver gets into this sort of mindset, it takes something to change it, and usually that is a victory. For now, though, Rosberg is yet to get everything together this season. He is doing a neat and tidy job, but it's not enough. Right now, he is in a similar position to the one Andy Murray faces in tennis. Murray is a superb player, but he is competing in an era of three all-time greats - Novak Djokovic, Roger Federer and Rafael Nadal. Those guys will become legends of the sport. And it is the same for Rosberg, racing in an era that contains Hamilton, Fernando Alonso and Vettel. Rosberg needs to throw off the internal pressures - and that is very difficult to do. His problem is that the media adds to it. So far, Rosberg has fronted up to all the questions about trying to beat Hamilton. But it might be a better idea to decide not to go there and refuse to answer them. China was another example of him not doing quite the right thing. I don't think his comments after the race, accusing Hamilton of backing him into the Ferraris, did him any favours at all. It betrayed a weakness. I know how he feels. When I joined Audi in sportscars, I had already won Le Mans with Porsche, but it was some time before I won it with Audi. And Audi kept bringing it up, which made it worse for me and added to the pressure. It was like telling the media what to ask, and of course then every question focused on the fact I had not yet won Le Mans with Audi. There are simple things you can do to alleviate some of that pressure, and Rosberg needs to work out what they are and do them. Rosberg is perhaps not on the ultimate level of Hamilton at his best. But he has the speed and the capability to be there or thereabouts - he proved it last year. You don't go to bed a fast driver and wake up a slow one, and you can only control yourself. So you have to concentrate on that, don't think about what the other guy is up to and get back to enjoying driving a racing car, because that is what will unlock those final couple of tenths of a second that make the difference between winning and losing. If Rosberg does not turn this around soon, it may be too late. Raikkonen is revived this year and Ferrari have two cars that can mix it with Mercedes. That will increase Ferrari's development potential and they have nothing to lose, because they are coming back after their worst season for 21 years. Ferrari are not quite there on absolute pace yet, but they are close enough to be a fly in the ointment. Last year, if one of the Mercedes drivers had a bad race, they would almost certainly still finish second behind the other, which mitigated their losses in the constructors' championship. But this year that is not the case. Ferrari are right there and will split the Mercedes if there is any kind of problem - such as Rosberg's brake failure on the penultimate lap in Bahrain that gifted second place to Raikkonen. In these situations, the championship can slip away from a driver quite quickly. At the moment, everything Hamilton touches seems to turn to gold. And Mercedes have already intimated that they would look at operating team orders if Ferrari start to get a sniff that they have a realistic chance of the championship and throw everything behind one driver. If that happens, with the way things are going at the moment, there is only one driver Mercedes are going to back, and it is certainly not Rosberg. It is building up into a very exciting year. You have the might of Ferrari with a cavalier attitude against the more methodical, process-led approach of Mercedes. There are going to be fireworks as a result.